The Rain-Induced Landslide Hazard Map shows areas’ susceptibility to landslide caused by rain. Susceptibility classification includes: High, Moderate, Low Susceptibilities, and, Possible Areas prone to Landslide Accumulation. Areas with low to gentle slopes and lacking tension cracks have low landslides susceptibility rating. Areas with moderate susceptibility rating have inactive/old landslides and tension cracks which are located away the community. These areas usually have moderate slopes. Areas with high landslides susceptibility rating have active/recent landslides and tension cracks that would directly affect the community. Those with steep slopes and drainage that are prone to landslides damming are also high susceptibility to landslides. The possible landslides debris accumulation zones are the area where landslides debris could accumulate. 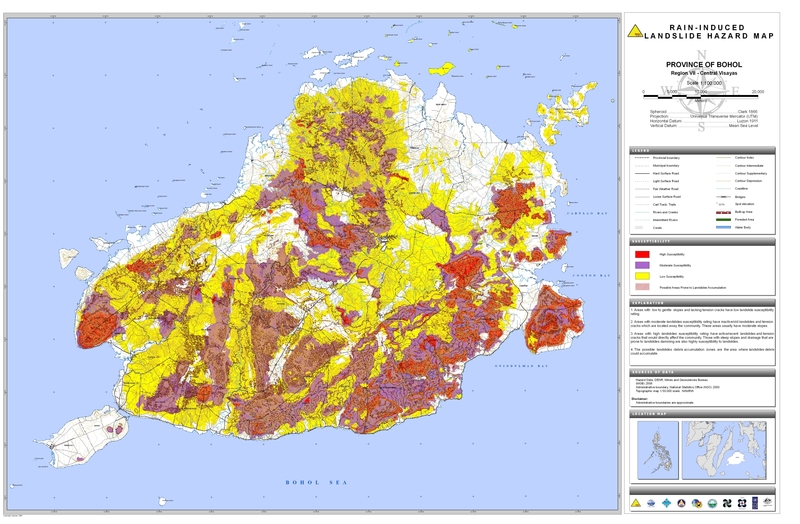 The Rain-Induced Landslide Map is acquired from the Hazards Mapping and Assessment for Effective Community-Based Disaster Risk Management (READY) Project through the Philippine Institute of Volcanology and Seismology (PhIVolcS). The Hazard Data in the map is from the Department of Environment and Natural Resources (DENR), Mines and Geosciences Bureau (MGB) 2008, Administrative boundaries from the National Statistics Office (NSO) 2000, and, the Topographic Map 1:50,000 scale is from the National Mapping and Resource Information Authority (NAMRIA). i am a architecture student from DHVTSU in pampanga. i’ve been there in bohol last month for my thesis but i did’nt met all the requirements needed for my thesis. i would like to ask if can have a copy of related maps of bohol specially in tagbilaran for my feasibility studies.. thank you..
You can find a lot of maps from the Provincial Atlas. 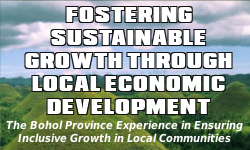 However, they are intended for use at provincial level, as it is our main concern. You may also ask the Tagbilaran City LGU for maps specifically for the city. The provincial atlas maps are interesting and useful. The PDF link for the above rain-induced landslide hazard map links through an FTP site which requests a log-in password. The JPG link is direct to image. The READY Project usually includes rainfall and river gauge monitoring. Do you know if the Provincial Government was involved with establishing monitoring sites? Hi Mr. Gardner, thanks for the comment. The link to the PDF file is now fixed. With regards to the rain and river gauges, I’m not sure if such data is being submitted to our office. I’ll ask around when my colleagues are back from their Christmas vacations. Merry Christmas.